September is the "only" best season for making authentic green yuzu-kosho. Since luckily I was back in Japan during the season, I ordered the ingredients from Oita prefecture (the top yuzu-kosho production region in Japan) to make my own batch. Just 3 ingredients for yuzu-kosho. 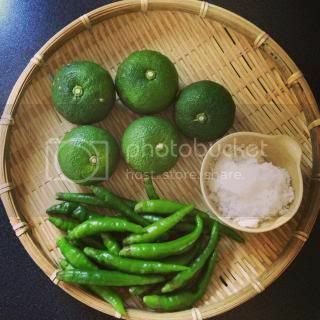 Green yuzu (from Innai-machi, Oita), Japanese green chili pepper (from Innai-machi, Oita), and sea salt (Nazuna natural sea salt, from Saeki, Oita). Rind of each yuzu was sliced off. Peppers were cut into small pieces. For 60 g yuzu rind (from 5 green yuzu), 60 g of pepper and about 20 g of salt are needed. Yuzu rind was put in a food processor and pulsed (quite patiently) until very finely minced to become almost like a paste. 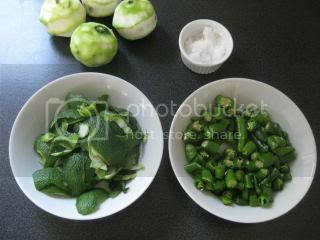 After the pulsed yuzu rind was removed from the food processor, the peppers were pulsed until they become fine mince. 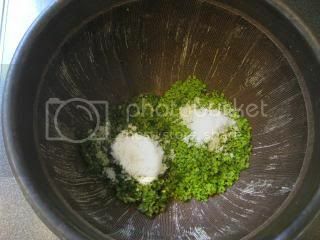 Yuzu rind and pepper were then combined in a Japanese mortar ("suribachi") and the salt was added. 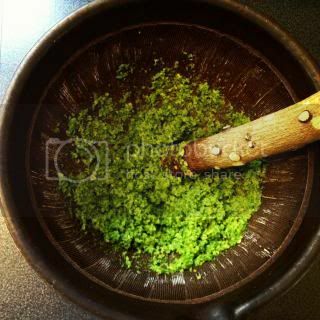 They were ground by using a pestle ("surikogi") until they beame a fine mash. It took me about 10 minutes non stop. 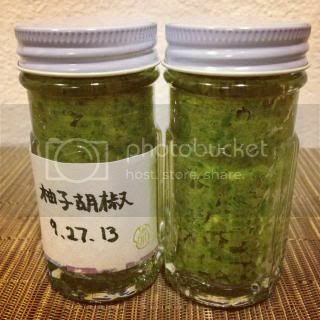 My homemade yuzu-kosho was finally ready! It was put in bottles to store. My yuzu-kosho tasted so vividly flavorful and aromatic. Very hot, too! 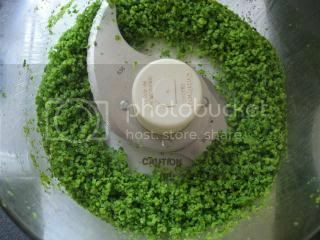 You can enjoy yuzu-kosho immediately after it's made, or it can keep up to 1 year in refrigeration. I can't wait to try my homemade yuzu-kosho with my hot pot dishes. Maybe the first dish will be Chicken meat ball and cabbage hot pot, made in my classic-style donabe.